Извините, этот техт доступен только в “Американский Английский”, “Болгарский”, “Европейский Испанский”, “Немецкий”, “Греческий”, “Французский”, “Итальянский”, “Македонский”, “Польский”, “Европейский Португальский”, “Румынский” и “Турецкий”. For the sake of viewer convenience, the content is shown below in this site default language. You may click one of the links to switch the site language to another available language. Извините, этот техт доступен только в “Американский Английский”, “Европейский Испанский”, “Немецкий”, “Французский” и “Итальянский”. For the sake of viewer convenience, the content is shown below in this site default language. You may click one of the links to switch the site language to another available language. Извините, этот техт доступен только в “Американский Английский”, “Болгарский”, “Европейский Испанский”, “Немецкий”, “Греческий”, “Французский”, “Итальянский”, “Македонский”, “Европейский Португальский”, “Румынский” и “Турецкий”. For the sake of viewer convenience, the content is shown below in this site default language. You may click one of the links to switch the site language to another available language. Ecotopia Biketour is not just about cycling for the sake of it — bicycles are also our sustainable mode of transport to get from one place to another. Although we seem to cover a lot of ground over the months we will be cycling for, you do not need to join the tour for the entire time and people can go at their own pace. It is certainly not a race and some days there will be no cycling at all. On an average cycling day, we will cycle around 50–70 km. In our experience, almost everyone gets used to this after a couple of days. People have joined us who haven’t cycled for 20 years, people who don’t do any sports in their daily lives, people whose physical abilities are impaired due to a recent accident. Everyone has adapted to the cycling after a couple of days, and for many it was a very empowering experience to find out that they can do it! Apart from that, many people have also successfully hitchhiked the daily route (taking their bikes!) when their bike broke down unfixably. Some people have even joined the tour hitchhiking without a bike. 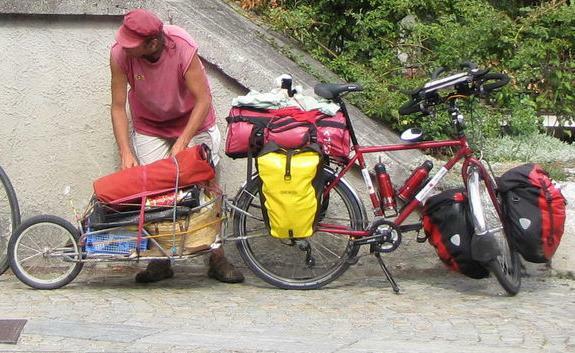 All you need is a rack and panniers (bike bags) attached to the bike. Two separate panniers are much better than just a big one (it is easier to take them off, and we need to do it every day). There’s also the possibility to carry four — two at the back and two at the front. No. 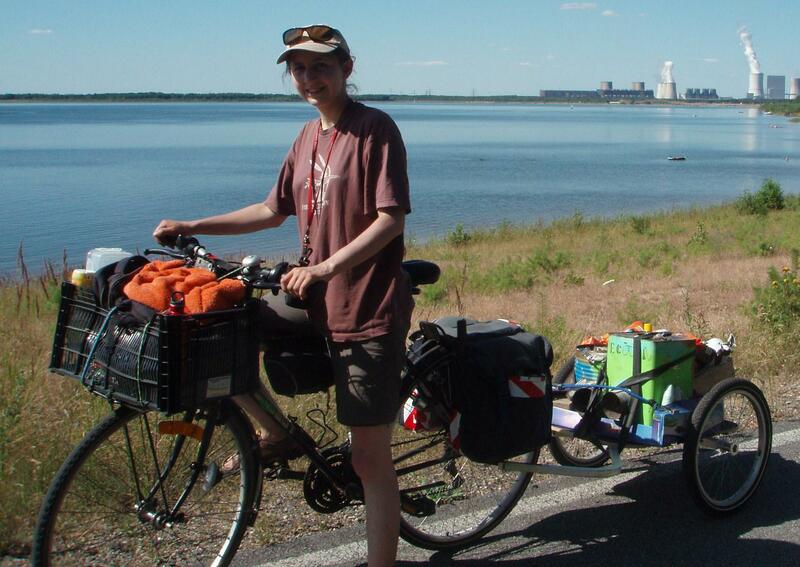 Ecotopia Biketour is a DIY tour — this also involves repairing one’s own bikes. There is always somebody that knows a bit more about bike repairs and that will be glad to teach and help. The most important thing to keep in mind for safe cycling with a trailer is the stability — pack the weight as low as possible and ride carefully, especially downhill and in curves — the trailers don’t have brakes and their weight can get you off-balance. Let someone show you how to securely attach the trailer to your bicycle including the security pins. As you carry all things by yourself you should think twice about what you bring («I always bring too many clothes!»). Bring front and back lights — in the countryside there is often no street lighting. When carrying a trailer ride particularly carefully — don’t underestimate how much it can get you off-balance in curves and/or down-hill. Извините, этот техт доступен только в “Американский Английский”, “Европейский Испанский”, “Немецкий”, “Французский”, “Итальянский” и “Румынский”. For the sake of viewer convenience, the content is shown below in this site default language. You may click one of the links to switch the site language to another available language.